My good buddy Jerry and I have been talking about lamb shanks for a very long time. When we get hungry, one of our favorite topics centers on lamb shanks: why slow and low cooking is essential to their tender-to-the-bone succulence, and how all that bone intensely flavors the meat. They truly are a labor of love. We can talk for hours about the best way to prepare them. Of course, Jerry considers himself an authority on lamb shanks, with good reason. He lived in Boise, Idaho for many years, and at one time married into a clan of Basques who cooked lamb like nobody’s business. He also made a point of frequenting the region’s Basque restaurants and managed to get into the kitchens of some of the best. 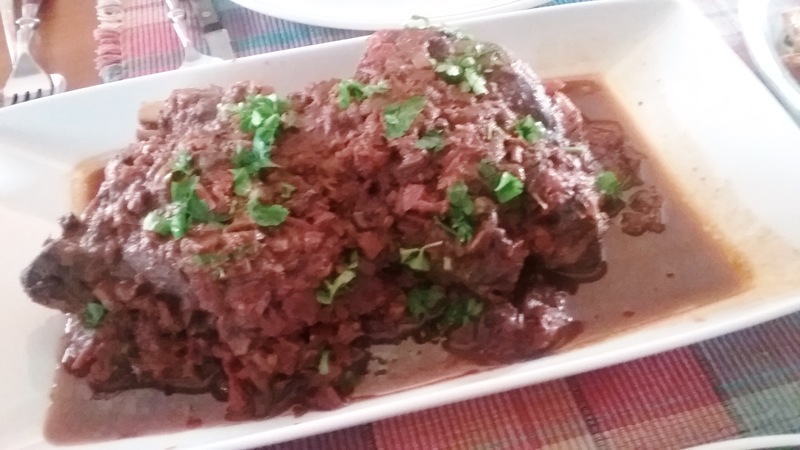 Of one in particular, Jerry maintains they credited their outrageous lamb shanks to a slow oven simmer in an awesome sauce based on mushrooms, red wine and sundried tomatoes. One weekend, we decided to stop talking and tackle the lamb shanks. We knew what we had to do and we were ready! Lucky us, we found absolute beauties at Roth’s Market that were just our size. One additional challenge: to utilize my fairly new Instant Pot, which sears, braises, and slow cooks until the cows come home. Two of these shanks fit perfectly in the pot, and still, there would be more food that we could possibly eat in one sitting. Jerry pulled out his knives and did the honors of stripping the shanks of excess fat, silver, and sinew until they were perfectly prepped and ready for the pot. It is attention to such details that can make the difference between ok and outstanding. Once the shanks were well browned off and holding in the slow cooker, the vegetables were sautéed in the pan’s drippings and added to the cooker. The pan was deglazed with wine and poured over the shanks, followed by the sundried tomatoes and their liquid, the beef stock, and herbs. Now, it was just a matter of time for the preliminary sauce to work its magic on the shanks. And so it did—to perfection. 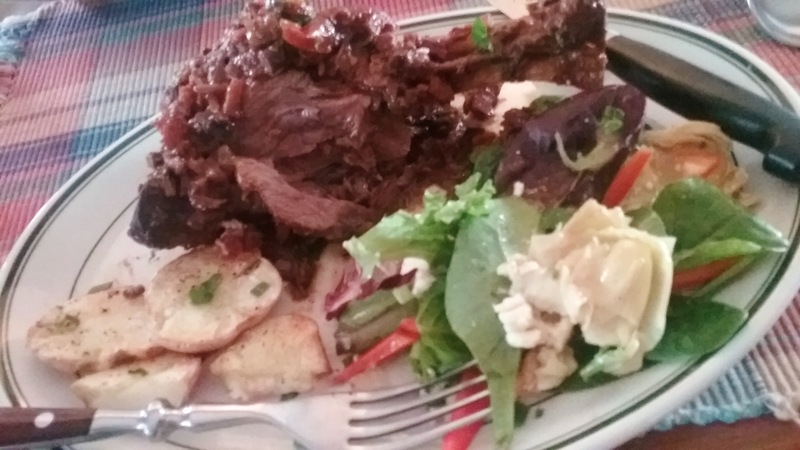 Although the photos indicate a mound of meat, in no way do they give adequate credit to the lamb shanks. In fact, they were taken in an absolute rush and secondary to the mission at hand. We had our hands full!! ¼ cup sundried tomatoes, reconstituted in 1/2 cup water and cut up. Save water. Trim silver and fat from shanks. Heat a wide skillet over medium heat and pour in oil to coat pan. Sprinkle shanks with salt and pepper and brown on all sides, about 10 minutes, and transfer to slow cooker. If necessary drizzle additional oil into the pot. Add onion, carrot, and garlic to pan and cook stirring often, until onion softens. Add the mushrooms and cook to release their liquid; transfer to slow cooker. Deglaze pan with wine and add to slow cooker. Add all ingredients except lemon zest, cover and cook for about 3 hours on high and test for tenderness. Add lemon zest and cook for approximately 1 hour longer approximately, or until the meat pulls back from the bone and is fork-tender. Adjust seasoning and serve with more lemon. Serves 2 very hungry people.